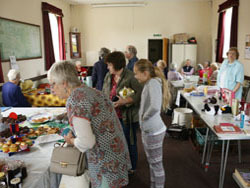 Once again a Macmillan Coffee Morning was held in Beckingham on Saturday 24th September 2016 in the Recreation Room, organised by Mrs Marion Brown ably assisted by her merry band of helpers. 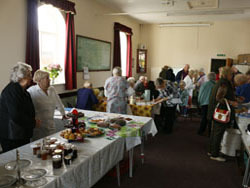 The stalls included Bake and Make run by Pauline and Pearl. The delicious cakes, bakes and preserves on this stall, all donated by local people, looked most tempting and always prove popular. The raffle, run by Pat and Brian, had many lovely prizes all donated. These included an attractive basket arrangement containing a plant in a willow cup and saucer surrounded by smaller items. There were two Wayne Howe Butchers meat vouchers, two Southwell Race Day tickets, a Golf Day from Ping and one £10 and three £5 Marks & Spencer vouchers from Salts Medical. Other prizes included a large Hydrangea pot plant from Sunrise Plants, a Cyclamen pot plant from R&G Garden Centre, Wilkinson’s voucher, Boots toiletries, a child’s tractor and trailer from Charles Lyons, and many prizes of wine, chocolates, biscuits and lots more generously donated by village residents, friends and family. 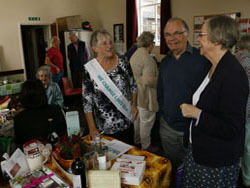 The tombola, again with many different donated prizes, was run by Val and Maureen. This is always popular and usually first to empty. The New to You stall with a wide variety of bric-a-brac items was situated outside and run by Marion’s daughter Jo. The all important refreshments of coffee, tea, juice and biscuits were available, served as always with a cheery word and smile by Kath and Shirley. Marion has decided this will be her last Macmillan Coffee Morning. She has been organising them for 13 years and in that time the events have raised over £10,000! Sincere thanks go to Marion for all her efforts and to all who have so generously helped, donated and supported. This year’s event took place on a lovely sunny day and was well attended with a steady stream of over 100 visitors making it a great success. The amount raised so far for this year is £754.47p.